Rancher Rob Krentz was shot and killed, March 27, 2010. Pinal County Sheriff’s deputy shot in desert confrontation Resulted in Pinal County Sheriff’s Deputy – Louie Puroll to be shot and injured by another cross-border ‘Drug Smuggler’s’ AK-47, April 30, 2010. Records show agents fired beanbags in fatal border gunfight Resulted in Border Patrol Agent – Brian Terry’s Death, December 14, 2010. New Mexico Rancher Killed by Alleged Illegal Alien Resulted in Larry Link’s Death on June 6, 2011. 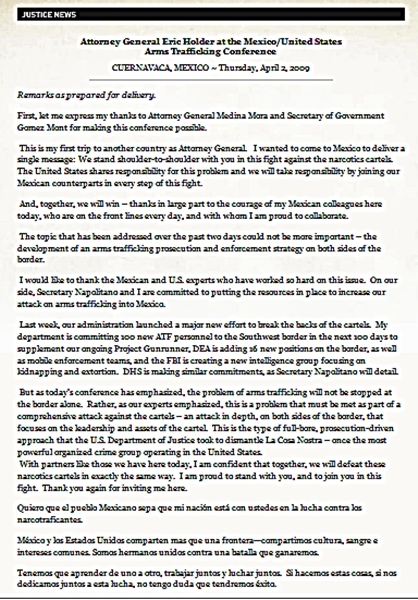 How long will Americans accept the fact that this illegal Usurper and his direct minions are engaging with illegal alien, drug-smuggling, law enforcement killers, private citizen murdering criminals, who in fact made purchases that were absolutely approved by the ‘powers that be’ with taxpayers funds covering the entire fiasco? Where are the calls for arrests, trials, and executions? How many more people on both sides of the southern border have been killed, or will be killed, due to Gunwalker aka Gunrunner?